What does IHL say about missing persons and the restoration of family links? Conflict and disasters leave more than physical wounds: in the turmoil, panic and terror, family members can be separated from one another within minutes, leading to long years of anguish and uncertainty about the fate of children, spouses or parents. The Geneva Conventions and their Additional Protocols seek to ensure that people do not go missing, notably by providing obligations concerning the recording of information about persons deprived of their liberty, obligations regarding the dead, and obligations related to the right of families to know the fate of their relatives. Each party to an armed conflict must record the personal details of every person deprived of his or her liberty, a prisoner of war, for example, or a civilian internee. This information must be provided to the prisoner of war or internee in the form of a capture or internment card. All these details must also be sent to relatives, either through the Protecting Powers – i.e. neutral States appointed to safeguard the interests of the parties to the conflict, and their nationals, in enemy countries – or the ICRC. Persons deprived of their liberty also have the right to correspond with their families (although the right of communication can be restricted, notably where that is an absolute military necessity). Each party to a conflict must take all possible measures to search for, collect and evacuate the dead as well as prevent the despoliation of their bodies. Parties to the conflict must endeavour to facilitate the return of human remains, if the opposing party or the relatives of the deceased so request. The dead must be disposed of in a respectful manner and their graves respected and properly maintained. All available information must be recorded prior to disposal and the location of the graves marked, in order to facilitate identification. • brothers and sisters born of the same parents or different parents, or adopted. Each party to the conflict must search for persons reported missing by an adverse party. The treaty rules for non-international armed conflicts are less developed. However, many of the rules described above apply to both international and non-international armed conflict as customary law. Missing persons are individuals of whom their families have no news and/or who, on the basis of reliable information, have been reported missing as a result of an armed conflict – international or non-international – or of some other situation of violence. • Families frequently lose track of relatives who have enlisted in the armed forces or joined armed groups, for want of any means of remaining in contact with them. Members of armed forces or armed groups may be declared missing in action when they die, if they were not equipped with the necessary means of identification, such as identity tags. • Individuals who are captured, arrested or abducted may be held in secret confinement, or in an unknown place, and die in detention. In many cases, their families do not know their whereabouts or are not allowed to visit or even correspond with them. Often, information about people deprived of their liberty is not recorded (date and place of arrest, detention, death or burial) or the records that contain such information are concealed or destroyed. • Many people are reported missing following mass killings. In many cases, the victims’ bodies are left lying where they died, hastily buried, transported elsewhere or even destroyed. • Displaced persons and refugees, groups of people isolated by conflict and people living in occupied areas may be unable to get news to their loved ones. These situations can lead to long separations. • Children also disappear, as a result of being separated from their families who were forced to flee sites of conflict, forcibly recruited into armed forces or armed groups, imprisoned or even adopted in haste and unceremoniously. • Finally, when bodies are exhumed and post-mortem examinations carried out, information that can lead to the identification of a deceased person is not always stored and managed properly. How does IHL deal with forced disappearance? Forced disappearance violates a range of IHL rules, most notably the prohibitions against arbitrary deprivation of liberty, against torture and other cruel or inhuman treatment, and against murder. In addition, in international armed conflicts, the extensive requirements concerning registration, visits and exchange of information with respect to persons deprived of their liberty are aimed, notably, at preventing forced disappearance. Parties to non-international armed conflict are also required to take steps to prevent disappearance, including through the registration of persons deprived of their liberty. The prohibition against forced disappearance should also be viewed in the light of the rule requiring respect for family life and that requiring each party to the conflict to take all feasible measures to account for persons reported missing as a result of armed conflict and to provide their family members with any information it has on their fate. The cumulative effect of these rules is that the practice of forced disappearance is prohibited by IHL. “A Central Prisoners of War Information Agency shall be created in a neutral country. The International Committee of the Red Cross shall, if it deems necessary, propose to the Powers concerned the organization of such an Agency. The function of the Agency shall be to collect all the information it may obtain through official or private channels respecting prisoners of war, and to transmit it as rapidly as possible to the country of origin of the prisoners of war or to the Power on which they depend.” (Article 123 of the Third Geneva Convention; see also Article 140 of the Fourth Geneva Convention for civilian internees). 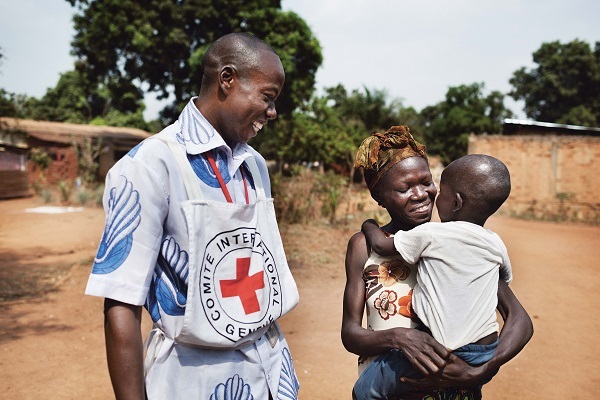 The ICRC is in charge of the Agency, which was renamed the Central Tracing Agency in 1960, to reflect all the activities undertaken by the Agency, activities that include other categories of person as well, such as non-prisoners, civilians and refugees.